Casa Loma Lakeshore Resort offers lakeshore living all year round! 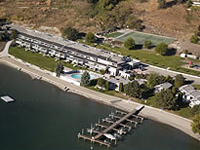 This Kelowna Resort is located on six acres of secluded Okanagan Lakefront property only 5 minutes from downtown Kelowna. This Okanagan Resort offers spectacular accommodations including One, Two, and Two Bedroom plus Den Condominiums, Two Bedroom Cottages and Townhouses and the ultimate in luxury, the Casa Grande Suite. 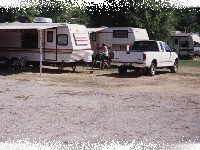 Four seasons RV & Condo resort located in the heart of the Okanagan Valley. Located on 67 acres we offer fully serviced, landscaped RV sites and spacious, furnished condo units available for rent or purchase. Idabel Lake Resort is located 30 minutes southeast of Kelowna & only 20 minutes from the Gem Lake ski lift at Big White Mountain. Idabel Lake is a tranquil mountain lake, set in a cluster of lakes, all within easy walking, biking or cross-country skiing distance of the resort. 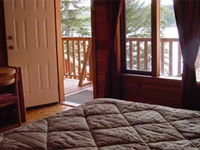 Enjoy one of 8 cottages or several lodge suites commanding a unique position overlooking the lake. 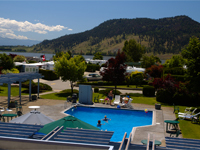 The Kokanee Beach Resort is centrally located in the beautiful Okanagan between Kelowna and Vernon. 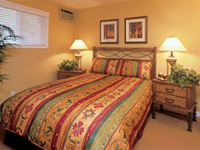 Our beachfront getaway is situated at the south end of Wood Lake. Winfield British Columbia. Our 1 and 2 bedroom units come with double beds and bunk beds, a large separate and well appointed kitchen, carpeted living room with hide-a-bed, colour cable TV and a full bath with shower. 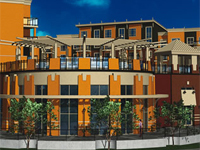 Escape to Lake Okanagan Resort just 20 minutes from downtown Kelowna, British Columbia. Beautiful accommodation nestled on one mile of waterfront on 300 acres of mountainside parkland along the shores of Okanagan Lake. The choices of activities are endless while enjoying your getaway. Whether life permits you to a two-week escape, a weekend hiatus or you desire a true home-away-from-home while travelling on business, Playa Del Sol Resort is the place to get away. Playa Del Sol Resort features 283 one, two and three bedroom luxury guest suites, each offering the comfort, convenience and modern style of full kitchens, living and dining areas with high-tech lighting, stereo system and TV/DVD, a TV for each bedroom, in-suite washer & dryer and private outdoor patios complete with furniture and gas barbecue.